Dash of Green: No More Diapers...Take 2!! That's right, it's that time again. At 15 months, William is out of diapers and wearing little boy briefs. Hurrah! Do you guys remember the post I did of Ella's graduation from diapers back in '10? You can read the post here. 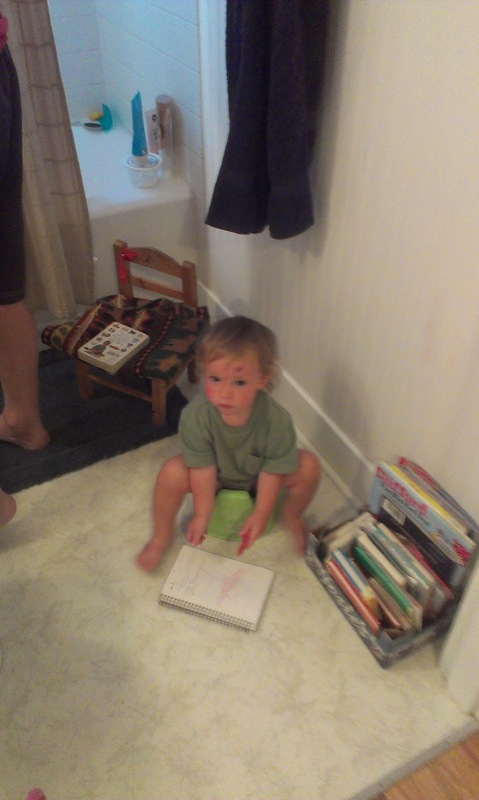 It details my personal process of potty training my kids, if you are interested. As you can imagine, it was a great stage to greet and one that I have been looking forward to with William since he was literally still in utero. Knowing that people always say that boys take longer to get the hang of the potty, I was afraid I'd be dealing with a diaper-clad baby longer than I had had to deal with Ella. Would you believe that on our entire Lake Waldo trip William never wore a diaper? As I've mentioned in this post and this one, his communication skills are pretty advanced compared to Ella -- maybe it's him or maybe it's me being a "seasoned" parent who can clue in on what babies are trying to say. Either way, Sunday I officially bagged away all his diapers and related periphenelia for good. A familiar sight in our household. As with Ella's graduation out of diapers, he still has his misses here and there. I'd say one to two any given day. Which ain't bad! It's reassuring to know, that that will decrease significantly over time. Truth be told, unlike with Ella, he is not as reliably dry at night. As in, he will wake up wet about once every week or two. It's still not that much, but juuuust enough that I opt to put him in some kind of protective gear at nighttime, just to avoid having a puddle in my bed. Then again...maybe he is only so prone to wetting at night because he has a diaper on. Hmmm...I will have to try him in just briefs and see how he does. Take care everybody and Happy No More Diapers...Take 2! !